Cornea Transplants/DSEK | John Frangie, M.D. DSEK Corneal Transplant Surgery – What is a Corneal Transplant? What is a corneal transplant, and how is the DSEK procedure performed? Learn the answers to these important questions and read all about the DSEK corneal transplant surgery right here. Your cornea may become damaged via direct trauma, or via degenerative disease. In this case, vision may be impaired, and there may be pain and other symptoms as well. So what is a corneal transplant? Well, as the word “transplant” implies, during corneal transplant surgery your damaged cornea will be replaced with a undamaged, clear cornea from a donor. However, with the DSEK procedure, or Descemet Stripping Endothelial Keratoplasty, the full cornea is not actually replaced. Instead, only some of the posterior or inner layers of the cornea are replaced with healthy tissue. DSEK corneal transplant surgery is a newer technique, and it’s also a complex procedure, requiring a skilled cornea specialist to successfully and safely perform. 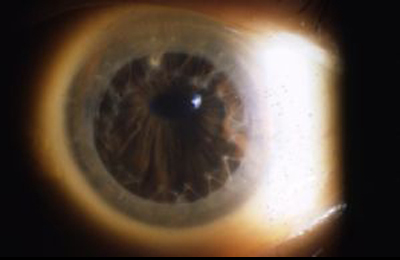 Cornea transplant approximately one week after surgery. 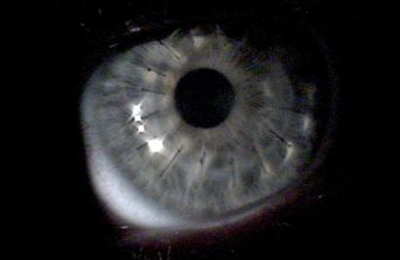 Multiple light reflections indicate folds in the cornea, which later resolved. As the DSEK procedure is still new, its long-term success rate compared to traditional corneal transplants is not fully known. It’s a more complex surgical procedure, and there is a risk that the surgery will need to be converted to a standard transplant, or that unusual scarring or complications occur, and a corneal transplant will still be required. As with any procedure, potential issues can arise such as damage to the iris or colored part of the eye which could change the shape of the pupil or appearance of the iris. During surgery, damage could occur to the natural lens to either speed up or cause the development of a cataract. Have no fears though, our doctors are here to talk to you and help you through the process and you can feel confident with the skill and experience of cornea specialist John Frangie, M.D., as well as the high-tech equipment and procedures he utilizes. Call our office at 413.363.2732 to schedule an appointment or consultation for DSEK corneal transplant surgery, from Springfield, MA’s leading cornea specialist, John Frangie, M.D.